International Medical Corps is partnering with a Mexico-based relief organization to provide emergency response and recovery services for communities affected by the two strong earthquakes that struck Mexico in September, collapsing buildings and killing hundreds of people. Help survivors in crisis around the world. Give now. The 7.1-magnitude earthquake struck 75 miles from the densely populated capital, Mexico City. More than 400 people were killed in the two earthquakes. 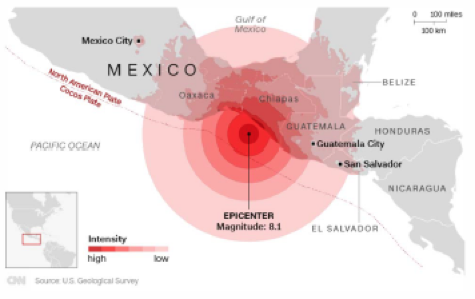 The September 7 quake was the strongest Mexico has experienced in 100 years. International Medical Corps is partnering with a local organization to support relief and recovery services for families impacted by the two earthquakes. This includes training first responders and other professionals interacting with affected communities in psychological first aid, a crucial skill set that gives practical tools and techniques for providing sensitive and culturally appropriate support to people who have experienced extremely distressing events. We are also working with our local partner to determine how best to support the outstanding needs of families still displaced by the 8.1-magnitude earthquake in Oaxaca.